Description: A 1-car shuttle ran between Mundelien and North Chicago mid-weekdays and weekends. Multi-car trains ran to and from Chicago during the commurter rush. Description: BN SD40-2s 8130, 8148, and 8161 are southbound north of Klamath Falls, OR on December 8, 1994 on the Southern Pacific's Shasta Division as the weather sets in. Description: BN 6032 has a company train and the Dinkey is non-push/pull. Title: BN 2057 (ex-CB&Q 921) and 5653 (ex-CB&Q 565) at Fairview Ave. Description: This was the ferry terminal which had boats to Norfolk, but by 1968 the connection was a bus which ran through the 2-lane (not 4 as today) Toll Tunnel, now I 64. Exact day of month not recorded. Description: 1309 is taking its transfer train from the farthest to the closest non-electrified track. There are only two electrified tracks coming through the station (the photographer is on the far south end of the platform) making it a bottlenck. 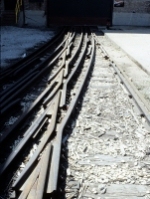 The track heading diagonally through the plant (under the first boxcars) is the only track to and from the South Shore's main tracks. So all CSS&SB and IC (Metra) electric trains must go through here and think of the days when many steam/diesel powered intercity trains ran on the non-electrified tracks. Note, in 2008 a rearangement of the tracks is underway to add the much needed capacity to allow additional South Shore and Metra trains. Also note the diamond near the lower right corner of the picture has movable points. Description: The Baldwin model number may be read as Diesel Transfer with 2 6-wheel trucks and 2000 hp. Description: Probably about Wheaton. Outbound left hand running. Freight is on middle track at speed. Description: Was built with a steam generator for passenger service. Description: Note the pantographs are down because the train is coasting through an interlocking plant. Description: Racks before passenger cars, just the opposite of the Amtrak version. Amtrak's makes more sense relative to slack action. Description: This is the Norfolk Southern's (ex-SOU) 5-mile long trestle off of which Katrina washed the tracks. NS fished them out of the Lake and was running again in a few days. There is a lift bridge near the north end of the trestle just out of the picture behind the train. Map at: http://railfan44.rrpicturearchives.net/showPicture.aspx?id=992957 #20 is on-time about 35 miles from NOUPT. Note the Heritage Fleet Diner mid-train. I hope it looks better on the inside. Title: I Think This is PRR 8419 Mountain View, Right? 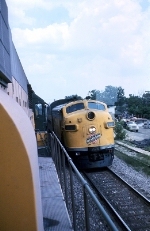 Description: This was train #111 westbound on the Milwaukee Road at Lanark, IL, 18 miles short of the Mississippi River on August 5, 1964. At Omaha, Neb., it would enter UP tracks. It was the combined City of Denver and City of Portland. At Omaha the City of Portland cars would be cut off and continue to Portland. Note the order boards in front of the station. Both high order boards were up meaning the agent had no orders for #111 or the next eastbound train. The agent was on the platform to inspect the train, as he should have been, and was waving to the fireman. Most probably that was his red Mustang next to the station. Description: CNW Tr. #2, the eastbound Kate Shelly 400 paused at DeKalb, Illinois on Dec. 28, 1964. It was not 7:00 a.m. yet. She left Clinton, Iowa well over an hour before where she slept the night and had about an hour to go to arrive in Chicago. She had a diner lounge car and coaches and certainly didn't not run the 400 miles her name implies. Her run was 138 miles. E-unit 5015A and its steam generator seemed to be working fine on this cold college break morning. Description: At Congress Park Commuter Station. Description: Spraying the station platform too! Do you think they brought enough chemical with them?